Spiritoons! 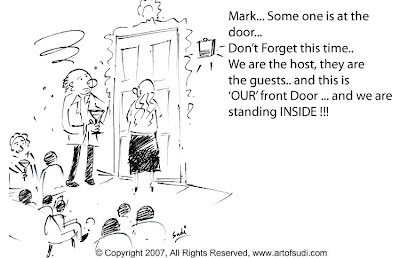 - World's First 'Non-Serious' Spiritual Cartoon Blog: Sudi Narayan's Spiritoon - We are The Host ! To remember is also a thought, but initially you have to do that. Until you "ARE". Once you ARE, no need to remember. Once you have it, there is no need to remember. Like a marketing list, once you have it, there is no need of it, you can throw it away. No need to throw also. Desires always means "to become" something (you are not). And you always feel that you will be Happy is that something is acheived or possessed. And man consumes the entire life for it. He is always in that state "to become". If he is always in the "Being" state, there is nothing left to become. Be in the "being" not in the "becoming"